Lately, we've been talking a lot at YPM about some of the challenges in giving people on-line access to collections. So I thought I'd share one of these problems with you. If you've worked with museum collections, and particularly natural history collections, this won't be new. But you may have gotten so used to it that you don't think about it anymore. If displays provide such limited access, what about giving the public physical access to the collection? Here you run up against another core role of museums - the need to exercise responsible stewardship and ensure the preservation of collections for generations to come. The fact is that security requirements and limited staff mean that most museums can only allow accredited researchers to access their collections directly. There is a middle ground, which is to take the public through on tours, as in the Darwin Centre at NHM, but even there the percentage of the collection that the public can see is limited to what is on open shelves or in the few cabinets that your guide opens. But as a member of the public, you are not free to directly explore the collections that we are holding in trust for you. By now, of course, those of you that know about these things are chanting "on-line access, on-line access." But what do we actually mean by this? For most museums, on-line access means some form of database that lets you search and retrieve records for specimens in the collections. For art museums, this might be a few thousand items. There is the potential to image all of the specimens, and also to provide some limited meaningful information (whether or not they fully realize this potential is another matter). But for natural history specimens collections can run to tens of thousands, hundreds of thousands, or millions of specimens. Assuming that you can capture the information, delivery of basic information is fairly straightforward. If you look here you'll see the results of searching the YPM collections for specimens of Notharctus. 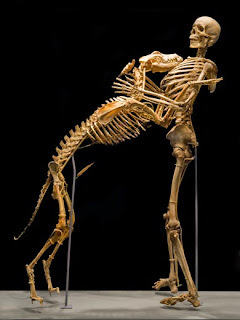 Notharctus is a small, lemur-like primate that lived in North America between 40 and 50 million years ago. You could probably figure this out by looking at the data that are associated with the specimens, provided you knew a bit about geology. But if you're Joe Public, your response is more likely to he "huh?" There are other resources out there that will tell you about Notharctus - here's one well-known example - but there's no way to access them from the database. Most museums, if they bother to address this problem at all, do it like this - you pick a particularly attractive specimen, often on exhibit, and write a short generic blurb about it. You can do this for items that are not on exhibit, but the problem is that most of the 286 specimens of Notharctus in the Peabody collections don't look like this. They look like the image on the left. I took a bunch of images of our collection of Notharctus and stuck them in a Picasa album which you can access here - it'll give you some sense of what the collection actually looks like. The blogger Jyri Engestrom has described how objects on the web have a "social gravitational pull" - how much people care about them, and how many "handles" an object has to generate discussion and conversation points. If we're trying to engage the public then ideally we'd want our museum specimens to have a high social pull. For some objects (e.g. a T-rex skeleton, or Carl Akeley's elephants) that may be the case. But our collection of Notharctus bits is a challenge. Even if we can get them onto the web, is anyone other than primate researchers actually going to be interested in them? One answer, as Frankie Roberto of the Science Museum suggested in a presentation at the 2008 Museums and the Web meeting, is that instead of generating lists of objects we should be making more use of aggregation pages to pull similar objects together. If our individual Notharctus jaw fragment isn't interesting in isolation, maybe a collection of Notharctos will be. Or a collection of primates. Or a collection of Eocene fossils from Wyoming. Assembling all of these things is possible using conventional database architecture. But a novel approach would be to allow the public to create their own aggregations that they find interesting, save them, and share them with other people. You could also give them the tools to enrich these "virtual collections" either with their own materials, or with content that we provide. The potential range of applications for teaching, research, or just plain old-fashioned amusement is enormous. And it moves us closer to being able to claim with truthfulness that we truly give the public access to the collections that ultimately belong to them. You you loan an object to a museum. Then the museum goes bankrupt. You'd imagine you'd just go pick your stuff up, end of story, right? Well think again. According to the New York Times, the owners of objects lent to the now bankrupt Sports Museum of America, which include a number of other museums , sports halls, collectors, and some big name sports stars, are being told by the trustee for the museum's creditors that in order to get their loans back they will have to pay fees that start at $250 per item and rise to $2,500 for more than 20 pieces, plus $750 for every 10 items above 20. According to lawyers for the trustee, the fees are intended to offset the costs of storage, cataloging, insurance and staff involved in returning the artifacts. I think the technical term for this is "chutzpah." The recent Nielson Report entitled Global Faces and Networked Places (2009) is attracting a lot of comment from bloggers and others in the area of museums and the web. I'm not going to talk about it in a great deal of detail, because others have explored its implications better than I can: I'd recommend this blog post by the ever reliable Nina Simon and this article by Jim Richardson in The Art Newspaper as two of the better offerings. However, if you are at all interested in the future of web-based museum and collections access I would urge you 1) to read the report yourself (c'mon people, it's only 14 pages long) and 2) circulate it to any one of your museum colleagues who's sceptical about the impact of social networking. Nielson are primarily looking at this from the perspective of advertisers, who are still scrambling to catch up with the explosive growth of this sector. But you don't have to be in advertising to grasp the implications of some of the staggering statistics numbers cited in the report. Two thirds of the world's internet population are visiting social networks or blogging sites. The growth of member communities over the last year (5.4%) is twice that of email (2.7%). The total amount of time spent on Facebook in 2008 was 20.5 billion minutes, a 566% increase since December 2007. In the coveted 35-49 year age group, Facebook added 24.1 million new users last year. Thats's a huge potential audience to engage with. Remember that the next time someone tells you this is all a big waste of time - if people are going to "waste" their time, you should be encouraging them to waste it with your museum. Chances are that if you work in a museum, you probably think Sustainability is a good thing, right? Getting rid of bottled water, recycling, reducing paper use, using motion detectors to turn off the lights when rooms are unoccupied – all sorts of good things like that. Well watch out, because the sustainability debate may take you to all sorts of areas that make you feel a lot less comfortable. In an earlier post, I discussed the question of whether environmental standards for collections care should be relaxed to reduce energy costs. Manchester Museum director Nick Merriman has gone one stage further. In a recent talk at the UCL Centre for Sustainable Heritage (reported by Maurice Davies in the April edition of Museums Journal) Merriman asked the question, are big collections sustainable? Big collections are expensive; they consume energy, both directly and indirectly. Yet the proportion of the collection that is used regularly (or at all) for research, education, and display is actually quite small. As part of an in-house planning exercise at another museum, we actually tried to quantify this. For a heavily-used collection of 400,000 specimens, we calculated that the average number of specimens examined in a day by an academic visitor is approximately 24. The number of visitor days per year is 200, so roughly speaking, around 2,400 specimens, or 0.6% of the collection, gets examined for research purposes every year. At any one time, the number of specimens from the collection that were out on loan for study at other institutions was around 400, or 0.1%. And the number of specimens from this collection on exhibit at the museum was around 250, or 0.06%. Let’s stop and take a look at those numbers again. Research, 0.6%; loans, 0.1%; exhibits, 0.06%. Now bear in mind that this is both the largest and one of most heavily used collections of its type in the world. Also consider that use of specimens is not uniformly distributed. Certain types of specimens (e.g. types) are going to be looked at repeatedly, as are ones from areas of particular strength. And there are only a limited number of researchers in the world, so the number of visitors will not increase proportionately with the size of collection. Add these factors together and it becomes apparent that for large collections there is a fraction of their specimens (and it’s a substantial one) that will probably never be examined. Collections are also growing. This is generally considered to be a good thing and not always for the reasons that the lay person might expect. Space is part of the holy trifecta of museum management, the other two elements being staff and money. There’s never enough of any of them, so everybody automatically wants more of what there is regardless of whether they really need it or not. Many museums engage in space planning exercises, and as part of these collection-holding divisions are usually asked to estimate the likely growth of their collections, over the next 10, 15, or 20 years. The numbers generated usually follow the formula of “as much as I think I can get away with,” the principal objective being to grab as much space as possible for your own division. Unfortunately, you sometimes get asked to demonstrate that these numbers are rooted in reality, and to do this you need to show that the collection really is growing. Now far be it from me to suggest that people sometimes acquire collections primarily for the purpose of occupying space – but the temptation is there. Museums have tried to address this at a policy level, by setting up approval procedures for the acquisition of specimens that mandate that they should be “relevant to the institution’s mission” (or similar language). This can act as a check against, for example, an entomology curator accepting a steam locomotive as a donation, but as museums tend to have very broadly-defined missions (e.g. “to study the natural world and communicate its wonders to everyone”) most half-way competent curators can get around this. To really tackle the problem, the institution has to develop a “collections plan,” which will codify why they collect, and by extension how, when, and how much to collect. This is an enormously valuable management exercise, and is by definition the sort of thing that makes curatorial hair stand on end. I’m sure I’ll be talking about it more in some later post. So let’s get back to the sustainability question again. We’ve established (I think) that we have big, expensive museum collections, only a tiny fraction of which ever get used, and which are continually growing, often in unplanned and unsystematic ways. This is a considerable challenge for museums as “green” institutions and is one that they should be tackling, right? To which I say – GET A LIFE, PEOPLE! The fraction of the planet’s carbon footprint that is attributable to the growth and maintenance of museum collections is miniscule in comparison to, say, domestic fuel consumption, forest clearance, antiquated Chinese industrial plants, or flatulent cattle in the developing world. Yes, museums should be worried about sustainability, but they should be targeting their efforts towards changing people’s behavior in ways that will have a significant impact beyond the walls of the institution. If you encourage your staff to use less paper, or avoid buying bottled water, or to carpool, then you are building onto wider movements. You are also encouraging behavior that can be transferred to families and friends. There are good institutional reasons for promoting both sustainability and collection planning, but if you try and use sustainability as an argument for collection planning, then you end up devaluing and damaging both concepts, because (despite evidence to the contrary) people that work in museums are not idiots. I was wading through a bunch of very old annual reports yesterday when I noticed that one of my colleagues had started work at the Museum in the mid 1970s. Doing more-or-less the same job as they're doing today. They've never worked anywhere else. Think about that. More than 30 years doing the same thing every working day. You would think they must love it, right? Well it's possible this is the case, but you wouldn't know from talking to them. I don't know why this surprised me. Museum departments are full of staff who are almost as old (and frequently a lot more peculiar) than the specimens and artifacts that they are looking after. In fact, as I thumbed through the pages of these reports from the late 1960s and early 1970s, I kept on coming across familiar names and faces. In some cases, they didn't seem to have aged at all (too much exposure to formaldehyde, perhaps) and it was a little disconcerting to see their faces staring out from the era of Richard Nixon and the Patridge Family. This was the first time I'd ever actually considered what it must be like to have a career like this. I finished my PhD in 1992. Since then, I've worked for 5 different employers; in 5 different museum collections, 2 government agencies, and a university administration office. All of these jobs were very different: the Oxford University Museum is a quite different beast to the AMNH, for example, which is in turn very different to YPM. General zoological collections present a different set of challenges to a mammalogy collection, and paleontological collections have very different challenges to recent ones. And, of course, museum collections are very, very different work environments when compared to administrative offices. So every time I've moved job, it's been a learning opportunity (I'll leave it to others to judge whether I actually did learn anything). Lack of mobility in collection management is a fact of life. It's a specialist profession, there are few jobs around, and most of these offer little or no scope for promotion or career progression - I'll save discussion of why this might be for a later post. What we tend to do is to turn our vices into virtues and say that longevity is a good thing because the key to successful collection management is knowledge of your collection and this takes time. It isn't and it doesn't. Some of the least effective people I know, in and out of museums, are also among the most knowledgable. "Knowledge" can be a great excuse for not bothering to learn anything new. I'd also argue that you need to look at what was not being done while that knowledge was being acquired. Now obviously, there are some outstanding people in our profession who have worked their entire career in one place, and I've benefitted greatly from the collections knowledge accumulated by my colleagues at AMNH, YPM, and elsewhere. At the same time, the best way to advance both our institutions and the professional development of the people working in them is to encourage more mobility. New jobs may be few and far between, but there are other ways to get people moving. Our professional organizations should be thinking of ways to support and promote mobility, through fellowship and exchange programs. In addition, they should be working to educate museum management to see the advantages to their institution of providing staff with sabatticals and furloughs. I also think that as a community, we should also be alive to the possibilities of spending time working outside our immediate profession. How about a 6 month placement working in development, finance, human resources, or strategic planning, to give just a few examples? If nothing else, it might give some of us a better understanding of the broader context in which we work. As an administrator (past, present, and future) I get profoundly irritated when my colleagues speak disparagingly about the failings of "The Administration." I'm sorry, but spending 30 years staring down a microscope while counting the hairs on the asses of... erm, something microscopic.... does not give you special insights into the way a museum should be run. If nothing else, greater job mobility might actually provide you with some. You can read another update from Alex Fernandes about our ongoing collections assessment project on the AMNH's perissodactyl blog here. She generated a bunch of interesting results which Lisa Elkin and I have been working with her to interpret - expect publication at some not too distant date. Sadly I have had to explode her long-held belief that Smithsonian entomologist Ron McGinley, creator of the "McGinley Method" of collections assessment, was the possessor of a handlebar moustache. 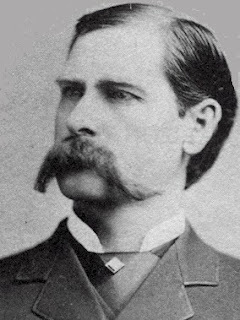 So instead, I have included this picture of Wyatt Earp. As you may recall, Kurt Russell played Earp in "Tombstone" (1993), which is arguably the greatest moustache movie of all time, but even the Hollywood version pales in comparison to the real thing. 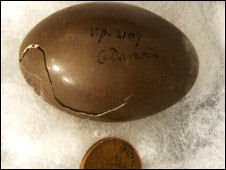 The BBC reports today that the Cambridge University's Museum of Zoology has "rediscovered" a tinamou egg collected by Charles Darwin during the Voyage of the Beagle. This is a nice story because the egg in question was spotted by an alert volunteer, Liz Wetton, who noticed that it had "C. Darwin" written on it. Now you may think this is a bit of a giveaway, and it is, but the penny often doesn't drop when people see the name written down like this - I've known people actually catalog specimens as "collector: C. Darwin" without realizing their significance (either that or they decided that it was not cool to get excited about Darwin, a sentiment that I can partly sympathize with). Anyway, kudos to Mike Akam, Director of the Museum of Zoology, for using this as an opportunity to highlight the important role that volunteers play in the curation of our collections. Note also that the specimen was damaged because the great man stuck it in a box that was too small for it. Some things never change. Some good news from South Dakota today, as the School of Mines & Technology breaks ground on its new Paleontology Research Center. This is going to be an outstanding facility for a really important collection and it's great to see new buildings like this going up at a time when most of the news from the museum sector, and particularly university museums, seems so gloomy. Good luck to them.